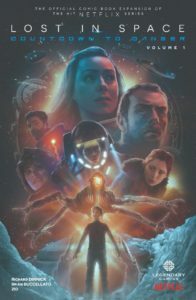 After Netflix’s modern reimagining of Lost in Space became a hit for the streaming service following its season one premiere, it really comes as no surprise that there’s now an expansion of that universe. As we wait for the release of season two, we have some brand new content to dive into courtesy of Legendary Comics to keep us occupied during the hiatus. The first volume of Lost in Space: Countdown to Danger is now available; the start of a series of graphic novels with some never-before-seen adventures for our favorite Lost in Space characters. Legendary generously provided us with a copy of volume one—which was just released last month—in exchange for a review. This will be a spoiler-free review, but a word of caution: it’s best to read Countdown to Danger after you’ve seen the Netflix series. One of the stories in volume one deals with some pretty vital information that’s revealed in season one for multiple characters, and it’s best to enjoy these scenes unspoiled. The first story in volume one, “Secrets,” written by Richard Dinnick, takes place before the Robinsons crash land on an alien planet. Like the rest of the Countdown to Danger series, it features gorgeous artwork by ZID. The art is both vivid and colorful, with a stunningly cinematic style that pairs well with the onscreen visuals of the series. It also dutifully recreates Lost in Space’s world, from the cozy, high tech Robinson home to the sleek, bright hallways of The Resolute as it moves through space. The beloved characters in these stories—the Robinsons, mostly, but Dr. Smith’s storyline parallels theirs in a surprising new perspective—are rendered with lifelike detail, their likenesses to their onscreen counterparts almost uncanny. There are plenty of secrets aboard The Resolute, as it turns out. As they start to unravel in this tale (some more costly than others), parallel storylines intersect in a really cool way and everything eventually comes full circle around Will Robinson himself. Though this story moves at a slower pace, the writing is engaging and fills in some of the blanks leading up to the attack that eventually tears apart the ship and sends the Robinsons on their journey. In the second story in Countdown to Danger, “Penny & Judith,” written by Brian Buccellato, Penny Robinson is the focus of the adventure. And the Judith that the title refers to isn’t exactly who you might expect… This mini episode is set after the Robinsons’ settlement on the alien planet and Will’s discovery of the Robot. Tasked with completing chores aboard the Jupiter 2, Penny takes a break to explore the nearby alien wilderness and things take a wild turn when she encounters a strange and adorable creature. Told with Penny’s signature wry wit and sense of humor, her perspective in this small yet action-packed story makes it an enjoyable, riveting read. Overall, Countdown to Danger is a worthy and compelling prequel to the Netflix series, and definitely something that fans are going to want to seek out before season two is released. Lost in Space: Countdown to Danger will have a second volume arriving in spring of 2019. Volume one offers a glimpse at the cover art, with two new adventures that will follow both the fan-favorite Robot and Dr. Smith.